Renewing an annual tradition where sociology students showcase their work and become aware of the research being done by their colleagues, the conference will feature papers representing diverse methodologies and sociological issues. A special focus highlighted this year will be research and theory in action. Some thematic questions include: What does it mean to conduct sociological research as an activist? Is there a way to connect methodology to action? What do we learn from doing theory and doing fieldwork that can contribute to significant change in society? How can we make sociology relevant? The 2016 Sociology Doctoral Student Conference gives doctoral students the opportunity to present their research or theoretical work while receiving feedback from, and networking with, peers. We invite paper proposals whatever the status of your project or wherever you are in your graduate career. We will consider proposals that extend beyond this year’s theme and from students in other disciplines. Please consider presenting your term papers or research projects. Everyone is welcome to submit a 200-word abstract to gcsoc.ssa@gmail.com by October 12, 2015. Include with your abstract a title, 3-4 keywords, your institutional affiliation, and any time constraints you may have for presenting on March 4th. The Program Committee will do their best to take these constraints into account when putting together panels, but cannot make any guarantees. Please also indicate if you are willing to serve as a discussant. Feel free to email us if you have any questions or comments. Friday, October 24: Open EC meeting! Please attend! Every year the Sociology Students Association gets to set the agenda and chair two Executive Committee meetings. The Executive Committee of the Sociology Department usually meets once a month in closed meetings (with two SSA reps present), but the SSA-chaired meeting is open to all students and faculty! We value this opportunity to raise and advance student concerns, and we encourage students to attend and take advantage of this forum. If you’re interested in helping to set the agenda for next term’s meeting, please attend SSA meetings. A few weeks ago we had a welcome party for new students. -The SSA brought up the point that we needed clarification, formal documentation of the process and the criteria being used to assign fourth members. -Does this person get appointed before or after there is a draft of the proposal done? -If it is before, what is the decision based on? -Torpey clarified the “spirit” of the measure and assured us that this appointment would be done in conversation with the committee chair. -Torpey also talked a bit about how the process should proceed: the process on how students should go about doing this is to approach Rati and Torpey when they have three members on their dissertation committee (at the proposal stage), and then Torpey would suggest the 4th member; according to Torpey, this process has taken no more than a week with the students who have gone through this so far. -This process will be reviewed at the end of this year. -Torpey agreed that he will create a document outlining the procedural requirements on this, as well as the specific responsibilities of the EO, the dissertation committee chair and the student. -After the meeting Koby (and other students) mentioned that he thought the plan that was approved by the EC last year referred to student’s proposal committees and not the dissertation committee – however, Torpey was referring to the dissertation committee, and the forms; need clarification on this point. -Torpey reported that the conflict he thought would arise from the merging of awards decisions with admissions decisions was in fact not seen as a conflict from the view of the Provost’s office. So, students would continue to sit on the admissions committee. Sam (faculty) asked that we write a statement about why we think it is important for students to serve on admissions committees. -The SSA will take this idea into consideration. -The SSA asked that faculty also write a statement on the importance of students on the admissions committee; this was not explicitly endorsed by the faculty, who responded that they would rather see the student statement before making any statements of their own. -The SSA introduced the point that a faculty evaluation process had been requested by the SSA many times before with no action taken. The SSA affirmed that the spirit of this process, from the student’s perspective, was to provide feedback to instructors and ensure students had some anonymous way of responding to courses. -This discussion became confusing because there were a number of different ideas about what an evaluation process would look like, who would control it, who would see the results, and ultimately what the purpose of it would be. -Students should not dictate the content of a course (because this would be a violation of academic freedom), but that it is reasonable to give professors feedback. -Students could get their own process together where they share information about ways professors are present/absent in different ways related to supervision so that new students can be warned about bad supervision. -Concern that doing this through the web/making the results public could lead to issues about privacy and surveillance. -There is a danger in writing student reviews of courses and making them public because course content changes and it is not fair to treat it like it is static. -Overall, professors are open to feedback (and it was made to seem obvious that they were) but don’t want the evaluation process to serve as a disciplinary measure. -There was a lot of testament to the need for this from students. -There was pushback from faculty on the idea that students wanted to have some say in core curriculum – professors felt this was in conflict with ideas of academic freedom. -Students stated that the by-laws of the SSA (?) required that this committee meet with faculty. -It was agreed that by the end of the week Torpey would solicit and confirm 5 faculty to serve on this committee. -It was also agreed that the committee would meet with the 5 faculty members by the next open (?) EC meeting. -SSA raised the point that student advisors to the admissions committee want a discussion about what diversity should mean/look like in practice in relation to admissions. -Phil Kasinitz suggested that adding another admissions committee meeting was not necessarily the best way to address this. -Barbara Katz-Rothman highlighted an article she had passed around about discrimination against part-time students – this should also make it into the discussion. As there was interest in attending the next executive committee expressed on the GCSOC list serv, please be advised that the next EC Meeting is Friday Nov. 15th at 1pm. We generally meet in the thesis room. Chrissy had recommended bringing the open meeting procedures (which can be found here http://www.cunydsc.org/open-meetings-procedures) in case the faculty raises questions about non-SSA rep students attending the meeting. Also, mark your calendars, the next SSA meeting will be Friday, November 22nd at 3pm (location to be announced). It was discussed whether or not we want to publish a newsletter like other departments do (it would target current and past students) and whether or not we want to send out an email to alumni, asking them to donate money to our travel and grants fund. As the SSA Alumni Relations representative, Colin offered to draft the newsletter by collecting Rati’s emails about faculty and student achievements and also soliciting notifications from the GCSOC list serv. He will also research possible mail merge or eblast platforms that are cheap or free. In addition to being emailed out to alumni, the newsletters can be posted on the SSA website. In the interest of making the popular and student driven Purposeful Pedagogy Workshop, Jonathan Davis and Sara Martucci have solicited interest from the student body of people interested in taking the lead on the organization and execution going forward. They are meeting Tuesday, November 5th at 3pm in the Sociology Lounge if you would like to join. If you are unable to join at that time but interested in participating in this project, email Jonathan. Also, the Professional Development Department has approached Jonathan and Sara, indicating their support for the workshop and it looks like funding may be made available to ensure its sustainability. This month, the FMC did not meet because there were no dissertation proposals to review. However, it was brought up that this committee is tasked with addressing faculty issues as well, and there are a number of faculty issues circulating that need to be addressed. Furthermore, FMC is responsible for reviewing faculty applications from other CUNY campuses to become GC affiliated. There were such applications submitted and yet the committee did not meet. Finally, it was pointed out that other departments regularly review their list of affiliated faculty and remove those that don’t have an active relationship with the GC. Our department does not and it was suggested that this is a type of false promise to prospective students who are told there are 79 affiliated faculty but it’s really a much smaller pool of faculty students have opportunities to interact with at the GC. C&E has not yet met this semester because it hasn’t been constituted. At the open executive committee meeting, Torpey said that he would appoint faculty to the committee by the next executive committee meeting (November 15). Also at the open ec meeting, this committee was appointed with discussing course evaluations, orals list, a senior proseminar for job market preparation, and assisting Torpey in drafting the new fourth member dissertation committee process. Obviously, this committee has been tasked with a lot of substantial work and it is concerning that it was not constituted prior to students pressuring Torpey to do so at the open ec meting. It was brought up that a student had digitized the lists but no one was sure what happened to those pdfs. An SSA representative will be following up on that. It was agreed that the students should not be doing the work of the faculty in designing the proseminar, but that we can tell them what we would like to know (i.e. CV writing, job talks). If there are things you would like to see offered in this senior proseminar, please let the C&E reps know (Matt Block, Jonathan Davis, Albert Novelozo, Dave Monaghan). We can also remind the faculty that they may tap into the resources offered by the Career Development Center in developing this program for students. Finally, it looks like the senior proseminar will not be a class (see open ec debrief below for details) but perhaps it could be organized a type of job colloquium. The difference from regular colloquium, however, would be that it must involve opportunities for feedback to students who attend. In other words, the senior proseminar should not just be a lecture series of a workshop series. Technically, the student handbook is our legal contract with the department on the expectations of what we must do to complete our degree. However, the handbook is not being consistently distributed to incoming students and is out of date. It is the responsibility of the executive committee to update the handbook. And with all the recent or proposed changes in theory exams, oral exams, and dissertation committee constitution, the handbook would almost need to be updated after each executive committee. It was discussed how the SSA may be able to use the handbook strategically to stop such ad hoc procedural changes by holding the executive committee to actually update the handbook when these changes are passed. This subcommittee will also draft a statement of what an advisor-advisee relationship should be. This statement can be used to hold faculty accountable and also as an information tool for incoming students so that they can advocate for themselves. This subcommittee will bring their findings to the next open executive committee meeting in the spring. This committee has also not met because it has not been constituted. Torpey has said he will propose the A&A committee members for approval at the next executive committee meeting (November 15). In the meantime, the current representatives are meeting with former representatives in order to pass along institutional memory. Hamad and Matt (the student representatives) will be sending out an email within the next month or so to solicit feedback from students on what topics, themes, etc. we’d like to see represented in the colloquium. They will use this feedback to inform the priorities they will advocating for in their meeting with Torpey this spring when they discuss colloquium speaker invites for next year. Bronwyn did an excellent job chairing the meeting, claiming the open EC as student lead. We should keep this going. A common point of resistance from faculty seems to be academic freedom. But it’s important to keep in mind – whose academic freedom? We need to continually reassure faculty that students aren’t trying to encroach on their academic freedom; rather, we’re trying to create an environment where the academic freedom of both faculty AND students is honored. The full minutes from this meeting are posted on the ‘Open EC Meeting Minutes – 10/18/13’ post. Step one was bringing it up at the open executive committee in order to talk it through with the faculty. That didn’t seem to get us very far. Step two will be to draft a letter on behalf of the student body, stating that this policy is in violation of governance process and should be repealed until the proper procedures are followed. The letter will be sent to the Dean of Social Sciences and DSC Governance Task Force. If this doesn’t work, voted on moving to a third option of going through the graduate council ourselves by drafting a procedure. Minutes from the open executive committee in addition to SSA meetings will be posted on the Open CUNY SSA website. i) Student participation in admissions process: Torpey has been instructed to review the department’s governance compliance, with a special eye to the provisions regarding student participation; Torpey was especially concerned about student participation in admissions and awards decisions; Bylaws require that students participate in the former but not the latter, however, these two are becoming increasingly commingled; It was agreed that committee members would check in with other departments to see how they are handling this issue and Torpey will consult the lawyers on the legal implications; It was also suggested that this issue be further discussed at the open EC meeting next month. iv) Senior seminar on preparing applicants for the job market: It was proposed that the department offer a Senior Proseminar to help students put together their job packages and give practice job talks. Because the department can’t run a class for Level III students, they would need to get an exemption from upstairs. But the committee seemed willing to do this and confident that it was possible. Read the CFP for the third annual graduate student conference sponsored by the SSA, Narrating the Social. The executive committee of the Hunter College chapter of the Professional Staff Congress condemns the widespread spying on Muslim students and campus clubs by the New York Police Department that has been revealed in an on-going investigation by the Associated Press. The clandestine operation goes back at least to 2003, according to the reports. Among the groups and campuses targeted were those at several colleges of the City University of New York, particularly Brooklyn College. At Hunter, as well as Queens College, City College and La Guardia, documents uncovered by AP reports say the police used “secondary” undercover agents, raising the possibility that other agencies or planted informants were used to infiltrate student associations. The NYPD’s spying, infiltration and racial, religious and anti-immigrant profiling target our students and violate the basic democratic rights of all of us who work and study at Hunter and throughout the City University of New York. They are a fundamental violation of academic freedom, the effect of which can only be to chill and intimidate inquiry and discussion. Such fishing expeditions violate the First Amendment of the U.S. Constitution protecting freedom of speech and association. The secret spying operation may also be in violation of a 1992 memorandum of understanding between the NYPD and the City University prohibiting city police from entering CUNY campuses in non-emergency situations without permission of university officials. Despite CUNY officials’ denials that they knew of the spying operation, in some cases NYPD detectives were reportedly given access to student records, which would place CUNY in violation of the 1974 federal Family Education Rights and Privacy Act. According to that law, this could mean that all federal funding to the City University would be cut off, including research funds, Pell Grants and federal student loans. The Hunter College chapter of the PSC joins with the Brooklyn Faculty Council in protesting this outrage, demanding that the police infiltration of City University stop, and calling on CUNY officials, including the Hunter administration and Public Safety Department, to detail their knowledge of or involvement in the spy operation, and to inform any groups or individuals targeted of the fact of the surveillance and the nature of the information gathered. Furthermore, we urge appropriate individual plaintiffs to submit a Freedom of Information Act request requiring the City University, the NYPD and other agencies (including CIA and DHS) to turn over any documents concerning intelligence gathering at CUNY. Any employees or officials of the City University who participated in, cooperated with or knew of this illegal operation should have their employment terminated forthwith. This must all stop now. The NYPD and all police/spy agencies must get off and stay off our campuses. Tony Kushner gets it right, again. The most important thing to emerge from the controversy about his being honored by CUNY is the need, as Mr. Kushner elegantly says, for “vigorous and consequential debate” about the conduct of one trustee and the board of trustees as a whole. The country’s most important urban public university deserves better than a board packed with political appointees chosen without regard for their understanding or even commitment to public higher education. A board with the authority that comes from deep knowledge of academia would have been less likely to remain silent in the face of Jeffrey S. Wiesenfeld’s abuse of his position. Let this embarrassing episode be the occasion for a rethinking of the process through which CUNY trustees are chosen. Mr. Wiesenfeld, who has repeatedly damaged the university with his disregard for academic freedom and disrespect to the faculty, should step down immediately, and Albany should pass legislation to reform the selection process so that CUNY gets the imaginative, independent trustees it sorely needs. We are pleased to present two symposiums on race in America. The first one on April 8th is entitled “Race and Science: New Findings and Challenges.” The panelists are Gabriel Haslip Viera (CCNY), Alondra Nelson (Columbia), and Ann Morning (NYU). The second panel on April 15th is entitled, “Race and Categorization: Changing Terrains.” Its panelists include Jungmiwha Bullock (US Census/Department of Commerce), Angelo Falcon (National Institute for Latino Policy), Imani Perry (Princeton), and Stephen Steinberg (The Graduate Center). Both events will be from 2–4 pm in the Dominican Studies Institute Library and Archives (North Academic Center 2/202). A reception will follow in the Faculty Dining Room (Amsterdam Room). These events are supported with generous funding from the Office of the CCNY President Lisa Staiano-Coico. 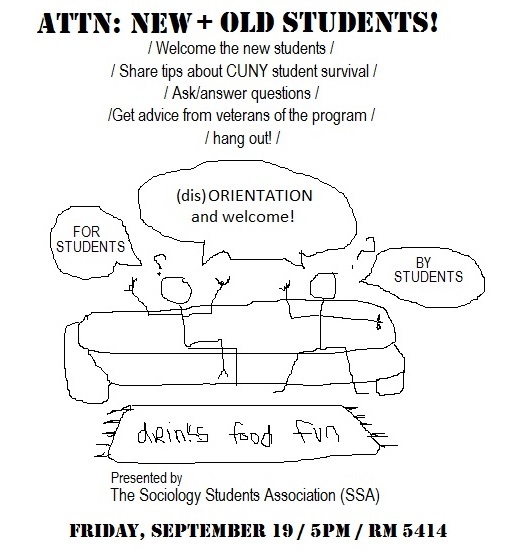 Please e-mail lpaik[at]ccny.cuny.edu if you have questions, need directions, etc.